Here you can set the title of your portfolio item, and at the main content area you can have a description of the project. You can also assign this portfolio item to a specific skill, at the “skills” panel at the right side. Last but not list, at the “portfolio settings” panel you should add the main portfolio image(s). If you add more than one image there, they will show as a carousel. At the portfolio edit page, at the bottom you will see a separate panel titled “Background Settings”. 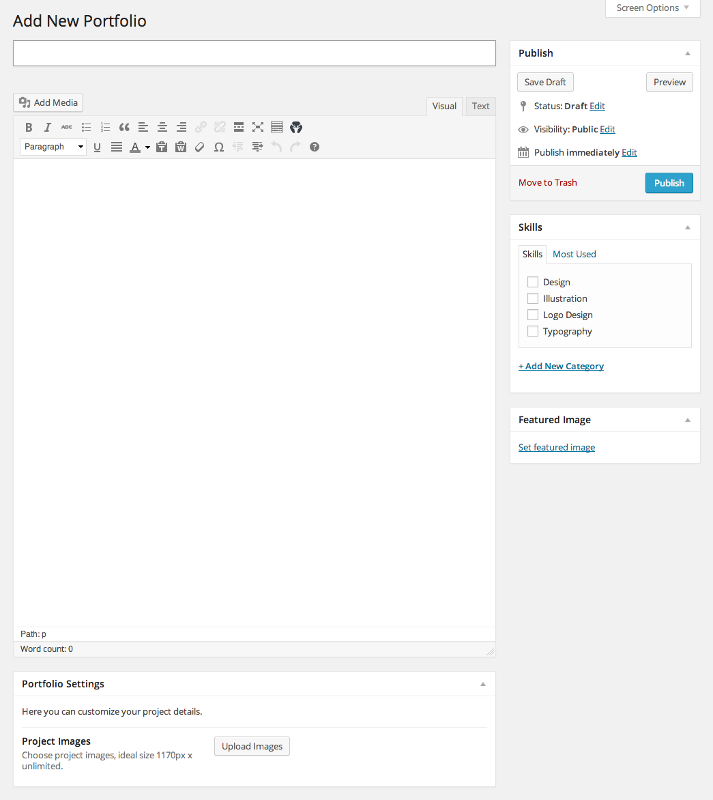 Through this panel you can customize the background of the main portfolio image section. You can upload a background image, set an opacity value for it, and get creative by blending the image with the background color. In order to show the portfolio section at the frontend, you should use a "Section:portfolio" widget. More details at the "Working with Widgets" section of the documentation.